One 2nd Class Relic of St Philomena in special beautifully detailed gold colored filigree case. 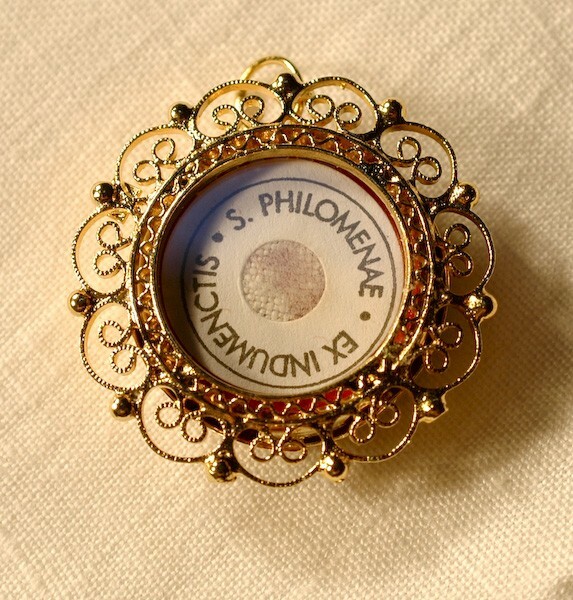 These2nd class relics are made of actual pieces of the vestment which has been adorning the earthly remains of St. Philomena's Sacred Body and Relics. Once every 50 years the “sacred urn of Saint Philomena”, containing her sacred remains, is opened in the presence of a special committee nominated by the Bishop of the Diocese of Nola. During this delicate procedure, the “urn and sacred remains” are carefully cleaned and then carefully redressed. The vestment on St. Philomena’s Sacred remains is replaced, and the original vestment is used to prepare these2ndClass relics. These treasured Relics for the faithful are then given as gifts from the Sanctuary to devotees if St. Philomena for private veneration. The “donation” requested for these 2nd Class Ex Indumentis Relics of Saint Philomena is not a payment for the Relic as Relics can never be sold. The “donation” is intended to help us cover the cost of the holder, medal or card which contains it as well as the costs of shipping. Please note that Ex Indumentis Relics are considered to be treasures of the faithful and should be venerated in accordance with theological laws. Please note the Relic is free of cost, the cost involved is for the locket and shipping.